100% natural combination of freshly pressed coconut milk and real fruit juices and purees… NO artificial additives or hidden nasties required! Smooze makes a healthy, deliciously-refreshing, anytime treat for adults and children alike; after yoga, the gym, work or school, reading a book, watching TV, after dinner or anytime you have that sweet craving. Smooze is a guilt-free, dairy-free, nutritious refreshment guaranteed to delight both your children and your inner child; you’ll fall in love with Smooze! Unfortunately, there is still a general misconception that coconut milk is bad for you because it’s said to raise blood cholesterol and cause heart disease. 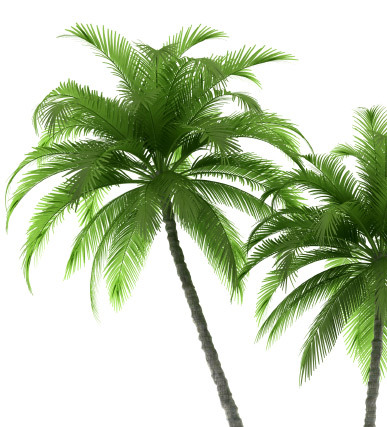 The only ‘‘proof‘’ is one forty-year-old study that used hydrogenated coconut oil. Widespread studies of coconut-consuming populations show that there is no direct link to high cholesterol or heart disease. Unlike other freeze-to-eat treats, our ingredients don’t read like they come from a mad scientist’s lab! Quite simply, Smooze is made with freshly-pressed coconut milk and real fruit juice and purees (we never use concentrates or reconstituted juices). Natural cane sugar: It’s important to know that the ‘sugars’ listed in the nutrition panel include the naturally-occurring fruit sugars (fructose) from the fruit juices and purees. 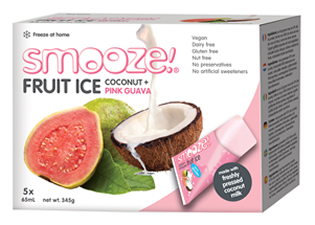 Smooze has, on average, up to 40% less sugar than other frozen treats. 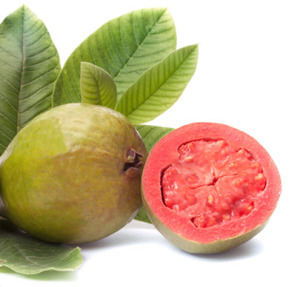 Ascorbic acid: a natural antioxidant also known as Vitamin C.
Natural fruit flavourings: all straight from nature. Smooze is made from the coconuts grown in lush coconut plantations on reclaimed coastal marshland in East Sumatra, Indonesia. * Cadbury – Creamy Vanilla as at August 2014. You can plate this one up as a dessert and serve with your favourite berries or pudding – YUMMY! Ingredients: Coconut milk 80% (coconut cream, water), natural cane sugar, maltodextrin, fructose, stabilisers (tara gum, locus bean gum, xanthan gum) natural coconut flavouring, salt. The sweet, ripe, nutritious pulp of mangoes is rich in pre-biotic dietary fibre, vitamins, minerals and antioxidant compounds with several trial studies suggesting that antioxidant compounds found in mango may offer protection against breast and colon cancers. Mango is specifically a good source of beta-carotene, potassium, vitamin B6 (pyridoxine), vitamin C and vitamin E.
The combination of mangoes and coconut milk provide a broad spectrum of valuable nutrients. 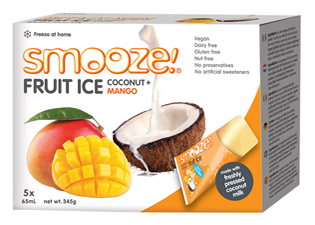 Smooze Fruit Ice Mango & Coconut comes in a perfect portion controlled Tetra pak. Tetra pak packaging locks in valuable nutrients without the need for preservatives AND it’s free from BPA. 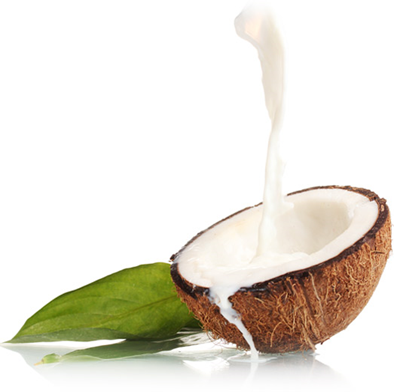 Coconut milk is a very good source of minerals like potassium, as well as the recently-proven health qualities of medium chain fats. It’s 100% Vegan and we could all do with a few less animal products in our diet. The ingredient list is so short. 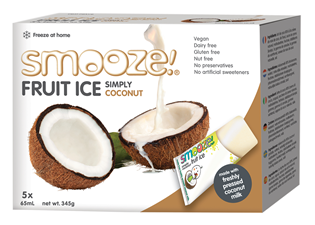 Coconut & Mango Smooze has a deliciously creamy texture that is reminiscent of ice cream and yet dairy free. Ingredients: Mango juice 48% (from puree), coconut milk 40% (coconut cream, water), natural cane sugar, gelling agent (fruit pectin), acidity regulator (citric acid), natural fruit flavourings, antioxidant (ascorbic acid). 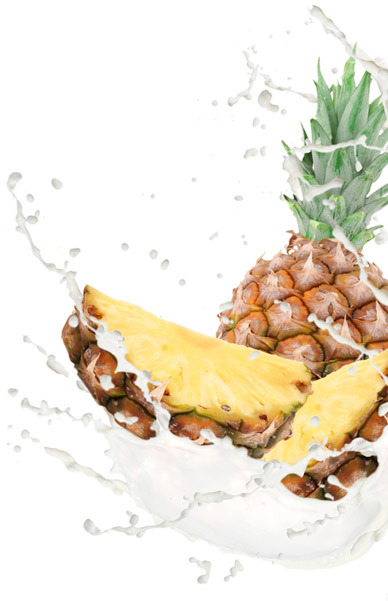 Ingredients: Pineapple juice 50%, coconut milk 38% (coconut cream, water), natural cane sugar, gelling agent:(fruit pectin_, acidity regulator (citric acid), natural fruit flavourings, antioxidant(ascorbic acid). 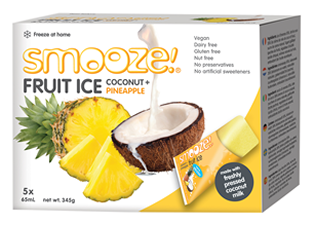 As Smooze is a ‘freeze at home’ fruit ice we are not in the frozen aisle which can make us a little tricky to find at times, especially as we are located in different places in different stores. Here’s a quick guide to help you find us…. We are located in the same aisle as the ice cream cones, maple syrups and toppings. In some stores this is at the end of the frozen section and in others it is near home baking and ambient desserts such as custard, jelly and rice pudding. If you click onto browse shop / frozen / ice cream / ice lollies you’ll find us there. We are usually located at the far side of the freezer section from the main store thoroughfare.